Clear, light, flexible – the perfect description of Axor Bouroullec products. 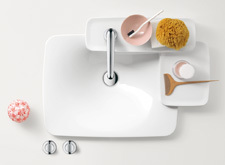 Organic, elegant design that we like to touch – from the spout and handles to the wash basin. Soft shapes without edges or corners flow into one another. An extremely understated design language that blends into the environment as if by chance. 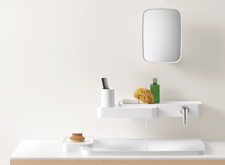 The Axor Bouroullec collection offers a completely new, innovative wash basin solution: the shelves that flow into one another are ideal for anyone who likes a great deal of room around the wash basin. They create the space to freely position the mixer and store multiple personal utensils. bathroom, including the shower, wash basin and bath tub area, as accessories, a wash basin element or an exposed installation mixer. The shelf from which water flows. 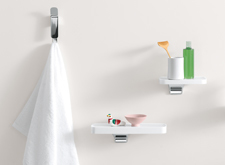 Whether on a wash basin, bath tub or shower, the exposed installation mixer is a shelf and a mixer in one. There are many ways for you to fulfil your own personal needs and desires, even in the shower. Individual modules for the classic concealed solution through to innovative exposed installation mixers with an integrated shelf – as a particularly practical element within your shower – round off the new collection. With its large shelf areas, the Axor Bouroullec bath tub provides you with plenty of space to position both the mixers and your personal items. You can also choose between concealed and exposed installation mixers or between mixers for the bath tub or the tile edge.